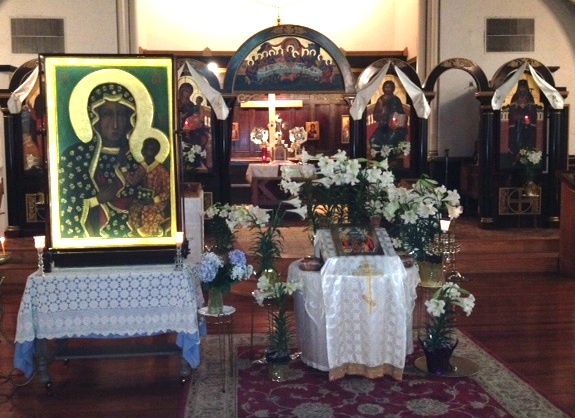 The icon of the Mother of God, Our Lady of Czestochowa, also known as the “Black Madonna” was at the Joy of All Who Sorrow Orthodox Church in Indianapolis on April 25-26, 2014. The purpose of the icon pilgrimage was to promote the sanctity of life, marriage and the family. It was taken to Vladivostok on the Pacific coast of Russia, from country to country to the Atlantic coast of Portugal, and over the Atlantic Ocean to North America in August 2013 and has been to 26 states.&nbsp; From Indianapolis, it is headed to the Shrine of Our Lady of Czestochowa in Merrillville, In from April 26 to 27. The icon was brought for prayer vigil to two abortion clinics located on 16th St and Georgetown Rd, Indianapolis . Seven lives have been saved since the icon has been brought to abortion mills for prayer vigils, according to Fr. Peter West, a Catholic priest and guardian of the icon. Joy of All Who Sorrow received the icon in a procession from Sts. Peter and Paul Cathedral.&nbsp; An Akathist to the Mother of God was served upon reception of the icon, followed by vespers in the evening and divine liturgy in the morning. Archpriest Fr. Stevan Bauman, Fr. David Wey and Fr. Dragan Petrovic served the Akathist.&nbsp; Here is the video coverage by Michael Drippe, member of the Joy of All Who Sorrow Orthodox Church.